The depressed turnout that cost Hillary Clinton the 2016 election was due to both voter suppression efforts by Republicans and the Democratic Party’s own inability to mobilize its base. The party has made some progress on both counts in the past year. However, party leadership still does little to energize voters to turn out for candidates running credible campaigns for genuinely progressive policies. Republican strategists are hell-bent on keeping targeted voters from the polls — specifically people of color, the young, and others apt to cast ballots for Democrats. Those efforts got a big boost from the Supreme Court’s Husted decision in June 2018 to uphold Ohio’s mass purge of so-called “inactive” voters. The ruling is expected to prompt other states to follow suit, just as the 2013 court decision weakening the Voting Rights Act and allowing purges without federal approval coincided with aggressive voter removal in nine states with a history of racial discrimination. The Democratic National Committee’s response to such measures has grown more robust in the past year, with the creation of the “IWillVote” program to register new voters and fight voter-suppression efforts. The initiative has provided grants in 41 states and territories, aiming to reach 50 million voters by the November midterm election. The party has also supported restoring felons’ right to vote. In April, New York Governor Andrew Cuomo pledged to restore suffrage to felons on parole. And Democratic leaders in Florida, including the party’s gubernatorial candidate Andrew Gillum, are supporting a ballot measure to restore felons’ voting rights. The Florida ballot measure is particularly important, taking place in a purple state where as many as 10 percent of adults are unable to vote because of a conviction. These common-sense, fundamentally democratic measures are popular among both Republican and Democratic lawmakers on Capitol Hill. Meanwhile, automatically registering everyone to vote has emerged as a popular and practical way to address discriminatory voter restrictions. In 2018, eight states and the District of Columbia approved or began implementing automatic voter registration (AVR). These laws were virtually nonexistent in the U.S. three years ago, but now 13 states and DC have enacted them. AVR represents a double victory for the party — registering millions of voters when higher turnout benefits Democrats, while also siding with clear public opinion. Two-thirds of Americans want automatic voter registration for citizens, including a majority of both Republicans and Democrats. 76% of the U.S. public supports higher taxes on the wealthy. 70% of the U.S. public supports Medicare for All. 59% of the U.S. public supports a $15 minimum wage. 60% of the U.S. public supports expanded tuition-free college. 69% of the U.S. public opposes overturning Roe v. Wade. 94% of the U.S. public supports an Equal Rights Amendment. 65% or more of the U.S. public supports progressive criminal justice reform. 59% of the U.S. public supports stricter environmental regulation. The Democratic Party routinely seems unable or unwilling to take full electoral advantage of such public opinion. Despite its expressed resistance to Trump’s agenda throughout 2018 and its embrace of some genuinely progressive positions, the party has not come close to addressing its fundamental lack of credibility with voters. This is manifested in the party’s continued slide in favorability; a Quinnipiac poll in March 2018 showed just 31 percent of the country had a positive view of Democrats — down from 37 percent four months earlier and 44 percent a year earlier, according to CNN polls. A survey by Rasmussen Reports found that 71 percent of voters wish Democrats would stress the specific policies where they disagree with Trump, as opposed to vague resistance. Chants of “No More War” from delegates at the 2016 Democratic National Convention gave voice to sentiments that still resonate through the base of the party and the broader U.S. public, notably in communities with higher rates of military sacrifice. While Trump’s 2016 victories in swing states may well have been aided by his posing as a foe of protracted war, his administration’s Mideast policies have largely exposed that masquerade. Unfortunately, the positions of Democratic leaders on endless war and bloated military spending offer little alternative to voters. Few Democrats in Congress are willing to strongly challenge the unaccountable military budget, which soaks up most discretionary spending that could be redirected toward the party’s proclaimed domestic agenda. During federal budget negotiations early this year — with Trump requesting a staggering 11 percent Pentagon budget increase over two years — Nancy Pelosi boasted in an email to House Democrats: “In our negotiations, Congressional Democrats have been fighting for increases in funding for defense.” The office of Senate Democratic leader Chuck Schumer declared: “We fully support President Trump’s Defense Department’s request.” Months later, an overwhelming majority of House and Senate Democrats supported the massive 2019 “National Defense Authorization Act” of $717 billion. 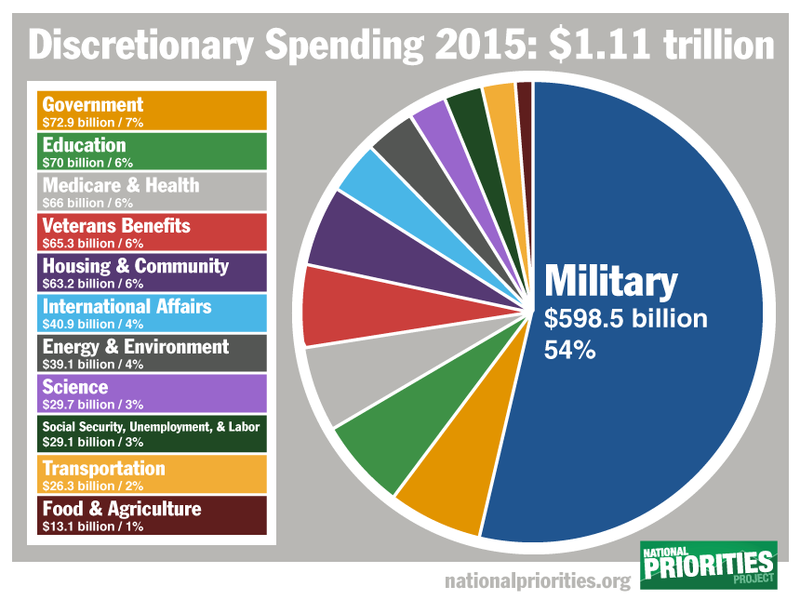 In 2018, few Democratic candidates for Congress conveyed to voters how military budget cuts could make an expansive domestic agenda possible. Notable exceptions include four newcomers (all women of color) expected to be sworn into Congress in January: Alexandria Ocasio-Cortez (NY), Ilhan Omar (MN), Rashida Tlaib (MI) and Ayanna Pressley (MA). While Democratic leaders failed to resist Trump over war spending, they did loudly resist the prospect of peace breaking out in Korea. In June, on the eve of nuclear talks between Trump and North Korea’s Kim Jong Un (a process sparked by South Korea’s progressive-leaning president), Schumer and six other senior Democratic senators sent a rejectionist letter to Trump demanding that any hint of sanctions relief for North Korea be dependent on an agreement with obviously impossible conditions. The letter mirrored GOP objections to Obama’s Iran nuclear deal. The United States and Russia possess 93 percent of the world’s nuclear weapons. Amid evidence of a Russian effort to help Trump during our 2016 election (evidently less effective and overt than the U.S. effort 20 years earlier that successfully backed an erratic, anti-democratic candidate in Russia’s presidential election), many Democratic leaders seem oblivious to the ongoing threat of armed conflict with Russia — a peril that was profoundly understood by Democratic presidents during the height of the Cold War when Russia had a much worse form of government. Reacting to evidence of Russian meddling in the 2016 U.S. election, numerous Democrats have engaged in extreme rhetoric, calling it an “act of war” and “equivalent” to Pearl Harbor. Democratic leaders have rarely acknowledged the crucial need for “a shift in approach toward Russia” including “steps to ease tensions between the nuclear superpowers,” in the words of an Open Letter for “Election Security and True National Security,” released this summer. With consistently moral foreign policies that reject costly militarism and continuous intervention, Democrats could inspire the party base and gain support among swing voters and independents (especially third-party voters). But advocacy of those policies comes mostly from a minority of Democratic “backbenchers,” not leaders. The party leadership has routinely been absent in the face of a humanitarian catastrophe in Yemen caused primarily by the U.S.-backed Saudi war (and the close White House alliance with Saudi Arabia). In March, Bernie Sanders, Democrat Chris Murphy and Republican Mike Lee forced a vote on their Senate resolution to end U.S. military support for the Saudis in Yemen. In the face of White House opposition and apparent indifference among Democratic leaders, it went down to defeat (55-44) thanks to ten Democratic “no” votes. With the disaster continuing to worsen in Yemen, the House Democratic leadership reportedly dragged its feet while progressive first-term Congressman Ro Khanna persistently led a bipartisan effort to get a vote on a similar measure; finally, in late September, Khanna was able to introduce the resolution with some high-level party support. Efforts to democratize the Democratic Party made some progress in August 2018 when the full DNC voted to bar superdelegates from voting for the presidential nominee on the first ballot. This significant reduction in the power of superdelegates — Democratic leaders, party officials and lobbyists — grew out of anger among many Bernie Sanders supporters about DNC favoritism exerted via superdelegates for Hillary Clinton. In the end, the reform passed with much support from the Clinton wing of the party and a major assist from DNC chair Tom Perez. Contrary to claims made in last-ditch efforts to retain the superdelegate system at the DNC’s decisive meeting, the reform moved toward greater racial diversity at the national convention. The most extensive research into the 2016 superdelegates, by the Pew Research Center, found that 20 percent of superdelegates were black and about 36 percent were people of color; numbers provided by the Hillary Clinton campaign showed that convention delegates as a whole were more diverse than superdelegates — 25 percent black and 50 percent people of color. During the 2018 midterm election campaign, Democratic leaders who were ostensibly committed to playing even-handed roles within the party too often acted as power brokers working against new insurgent candidates by backing their usually better-funded opponents. For instance, the Democratic Congressional Campaign Committee designated certain primary candidates for exclusive financial and strategy resources from the party, many times edging out a progressive opponent. The DCCC’s focus on fundraising orients candidates and elected officials to be politically inclined toward big-money donors and disconnected from constituents. A similar failure to maintain impartiality in primaries has persisted at the top of the DNC. Early in 2018, Chairman Perez repeatedly declared that the DNC should not endorse candidates in contested primaries. “One thing we’ve learned at the DNC is that when you, in fact or in perception, are trying to put the thumb on the scale in a spirited primary, that can undermine public confidence in us,” he said on C-SPAN. Yet in May he did a backflip and endorsed New York Governor Andrew Cuomo for reelection over progressive challenger Cynthia Nixon. The DNC’S encouraging action on superdelegate reform contrasts sharply with the DNC’s failure to act on a proposal by its Unity Reform Commission to establish a Financial Oversight Committee that would present an annual report on the DNC budget to the entire DNC, so that it could assess the effectiveness of expenditures and staff, as required by the DNC’s Bylaws. The current Finance Committee — entirely appointed by the DNC chair — conducts no evaluations of whether expenditures for consultants, media outreach and staff are accomplishing measurable goals. A Financial Oversight Committee could help achieve what the DNC has continued to lack: transparency and accountability in how DNC money is spent. After lengthy delays, the DNC’s Rules and Bylaws Committee has promised to place the oversight proposal on the agenda of the DNC winter meeting. In response to criticism of the secret joint fundraising arrangement that the DNC entered into with candidate Hillary Clinton in 2015, the DNC has now committed itself to making transparent its fundraising with candidates and its agreements with state parties. This summer, the DNC voted in reforms to promote more openness and accessibility in presidential primaries and caucuses. The reforms urge state parties to work with their state government to combat voter suppression and implement measures such as same-day party switching and same-day registration. An extreme example of anti-democratic barriers is in the state of New York, where voters must declare their party affiliation more than six months in advance. Those rules discourage electoral engagement, especially among people of little means and young adults. To get closer to living up to its name, the Democratic Party should rely on a broad base of small donors and refuse donations from corporations, particularly those with interests adverse to the party’s platform. The DNC’s reversal of its ban on fossil-fuel donations was a step backward. And the party gave a nod to insular politics when it adopted a new provision requiring a presidential candidate to affirm that he or she is “a member of the Democratic Party” and to acknowledge that the DNC chair is authorized to determine whether the candidate “is a bona fide Democrat.” Treating the party as a club that looks askance at non-club-members makes no sense when far more voters identify as independents than as Democrats. As with the original Autopsy, the research and writing of “Democratic Autopsy: One Year Later” was supported by Action for a Progressive Future, a 501(c)(4) organization that sponsors the online activist group RootsAction.org.